I love an award. It’s not often as adults we get to enjoy one. Remember the days in grade school, or if you have kids now yourself, how many awards you could earn in a given year? Actually, from what I’ve seen, thanks to FB, I think there are more given now than ever, but I digress. Now think about your adult life. Depressing, right? So why not celebrate when you receive one? 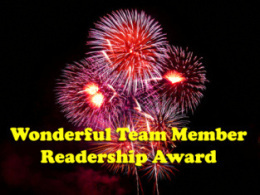 The Wonderful Team Member Readership Award is basically a Big Thank You to fellow bloggers kind enough to spend time, like, and comment. I, myself, was nominated by the incomparable Old School Harlequin from the World of Harley. Stop by his asylum and be lured in. So thank you, my friends. You encourage me every day, and in the life of this writer, it makes a difference. Congratulations, my friends! For all the love they’ve shown me, they deserve the recognition! Again, thank you to all of you who continue to follow along with me as I walk the writer’s journey. *Quick edit due to a total blonde moment – forgot the word Member in the title…it’s on the graphic. Ugh. *Shakes head.